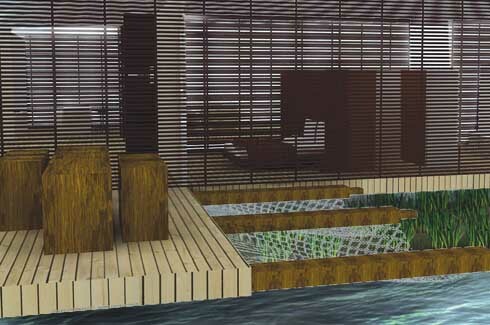 Morphogenesis, based in New Delhi, believes that design should be the combined result of multiple inspirations. This thought has delivered a portfolio of superb range and solid themes. Morphogenesis was started in 1996, and has pitched its efforts in architecture, interiors, urban design, landscape and master planning, as well as in environmental design consultancy. Much awarded and much exhibited, the firm’s wide range of interests and inspirations has ensured the build-up of a highly-sensitive portfolio. The team views design as a mighty amalgamation of a multitude of external and internal influences, which includes climatic conditions and even local traditions. These serve as points of discussion for every project, and that is testimony to its mature work approach. 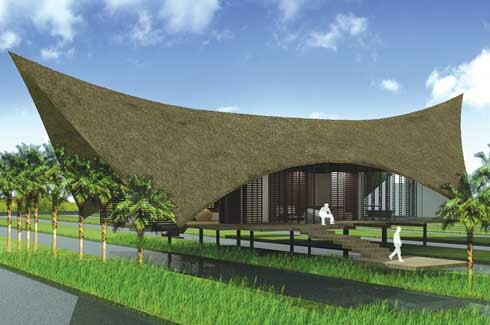 “It is this all-inclusive nature of design with a unique focus on passive and low energy architecture that we believe, will define the new emergent Indian architecture,” states the team. Led by principals, Manit and Sonali Rastogi, Morphogenesis is engaged in a constant cycle of building highly collaborative and highly people-friendly structures, spaces, and events. Three of them are mentioned here. Being so close to natural elements meant that weather conditions determined the shape, form and feel of the resort to the greatest extent. This is a high flood-level area, with channels of water 4.2 mt. wide running through, forming a lattice of land and water. “A script was developed with the given conditions and to maintain a sense of peace and individual habitation, rules were set out to determine thelocation of the villas; such as placement of node points, vehicle routes connecting the node points, pedestrian movement connecting all the nodes by the shortest route, placement of facilities, etc.,” state the designers. 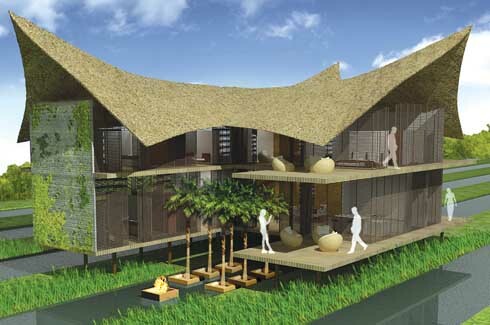 The visage of the resort structures harks back to the traditional approach of the ‘Nalukettu’ – a courtyard bordered by four blocks, with the roof slumping down from the sides. This is a great way of enjoying the rains. Aerodynamic, retractable roofs with perforated cantilevers top the villas, filtering wind and sunlight with such efficiency that night and day will remain appropriately cosy inside. The bulwark of this project, however, is the amazing sensitivity the design team has invested in it. 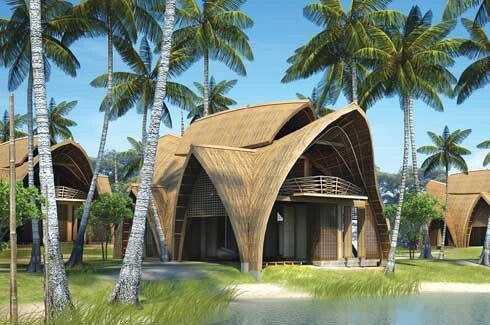 The efforts at building a micro-climate not just counters the weather vagaries and turns them into strengths, but also makes the resort a place where it is easy to feel at home. The towers of this corporate project stand like imposing sentinels upon a city already teeming with concrete totems of commerce. Purportedly, ‘iconic’ was the answer to the question on what this project aimed to become. Morphogenesis ensured this by resisting the temptation of building a mighty sprawl of an office complex, inspite of the generous 15,88,000 sq. ft. area at hand, and instead has imagined stacked up monoliths. The 3 towers – one ‘Iconic’, and twin office high rises – seem to defy gravity on the strength of some inexplicable prayer, and work a beguiling order of floors. The firm went vertical to challenge the staid horizontal layout of most corporate set-ups, and also to afford the denizens of this complex unbridled access to the open landscape. The facades also embrace environment consciousness – though their carefully planned orientation, they maximise sunlight intake, reduce heat gain, bring in more shade, and yet keep a sense of openness throughout. Terraces are the most brilliant aspect of the design scheme. 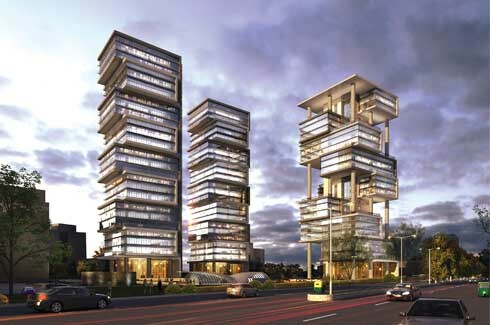 The firm has imbued every floor with such ‘break-out’ spaces, at the same time ensuring a unique facade by dramatically rotating their placement. Every 1200 sq. mt. office floor plate in the high office tower has a double height terrace measuring 100 sq. mt. The open spaces below are to be ‘experiential’, with food courts, a convention centre, and lots of open areas for conversations and ruminations. In short, productivity will be a guarantee here! No firm worth its while can duck the need for constant churning of ideas. Hence, the appropriate moniker, ‘Manthan’, for these informal gatherings of idea swapping, sharing and inspiring started by Morphogenesis. 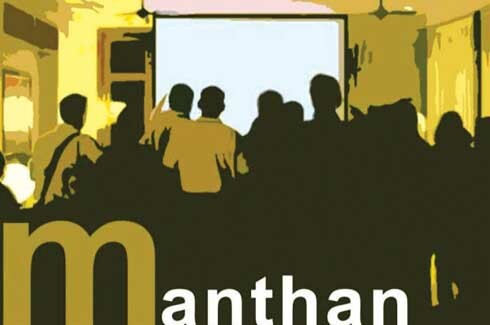 Taking after many of the limited exposure but maximum take-away forums that abound today, Manthan allows a maximum of 7 presenters a minimum of 7 slides, and 7 minutes to make an impression. At hand is a master of ceremonies who engages the presenters and the audience members to cull a list of future participants. This continuing cycle of events keeps the ideas in constant loop. 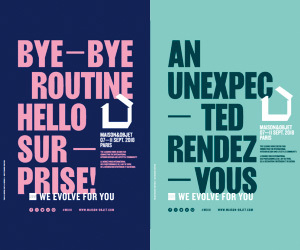 The format of Manthan is designed to include creative personnel from varied fields of art, photography, design, and many more, and give them a platform to share their impetus, motivations, approach and strategies. Starting from 2007, 16 such Manthans have been organised, with close to 110 speakers having participated. The firm has been in the midst of a break from the event since January 2011, to ensure that too many participants do not dilute its “intimacy”. It will, however, be revived this year.